MACAGANG BUSINESS CENTER (MBC) INC. was named after the once plentiful local bird named the CAGANG. In the local dialect the word "MA" means many. Because of the abundant Cagang birds nesting in the area, local residents instinctively named the location Macagang. Over the decades, the number of these birds have dwindled. Although the Cagang birds are almost extinct, visitors might be able to catch a glimpse of the indigenous birds from time to time. To revive the historical name of the area, the owner of MBC named their enterprise "Macagang Business Center" after the bird - CAGANG. MACAGANG BUSINESS CENTER was established in 1999 and opened for business in 2000 with an 8 unit Apartelle and a Banquet Hall with a capacity of 1,000 guests. Since then, adjacent lots were developed and expansions were made to include: "The only First Class, Triple A (AAA) Tourist Accommodation Facility in the Bicol region accredited by the Philippines "Department of Tourism". 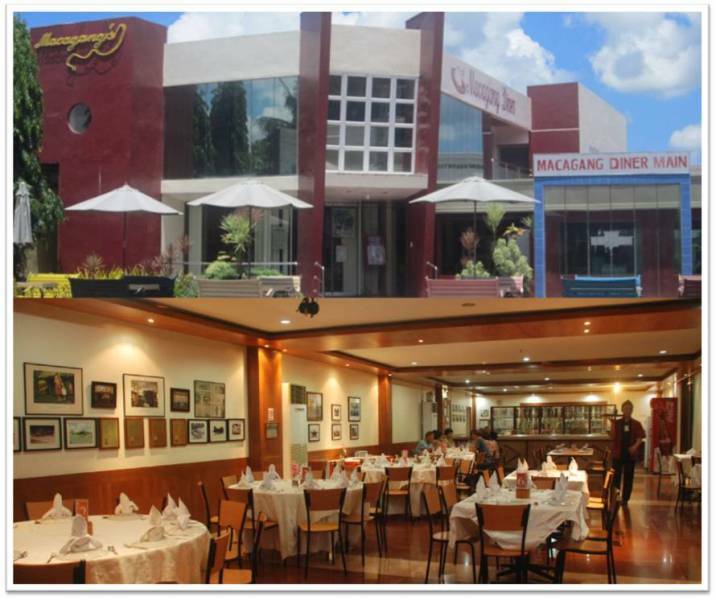 MACAGANG BUSINESS CENTER is a group of companies doing business as Macagang Hotel and Resort, Macagang Diner Main, Macagang Diner Centro, and Macagang Purified Drinking water. MACAGANG HOTEL AND RESORT includes an all-suite hotel, gym, tennis court, basketball court, volleyball and badminton courts, skate boarding, wall climbing and 7-hole mini-golf. 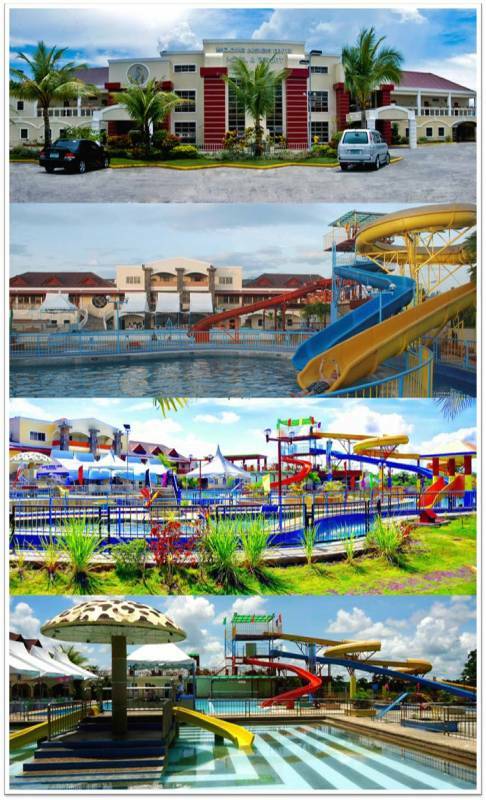 Its water park consists of a half Olympic size swimming pool, one teaching pool, wading and children's pools and a lazy river. Recent additions include a 25-feet high double loop slide, snake slide and kiddy slides. The Macagang Hotel and Resort offers all the luxury that you would expect in Manila and metropolitan cities but in the lush and beautiful surroundings of Nabua, Camarines Sur, Philippines. Nabua is a gateway to Northern Luzon and Southern Philippines through the Philippine – Japan Friendship Highway. Macagang Hotel and Resort is an AAA (First Class) rated tourist accommodation facility endorsed by the Department of Tourism (DOT) to the Board of Investment (BOI). In this contemporary all-suite-room hotel, you’ll enjoy a spacious bathroom including a large oversized soaking tub, seamless shower and tile vanity. In addition, each room includes LCD TV, mini bar, and safety deposit box. Our full sized glass panes allow panoramic views of the pool area and the skyline of Nabua. Our resort is a one-stop center with recreational facilities for teamwork development and family bonding. Designed as a Sports Village, we offer the following resort amenities: Wellness Center, fitness gym, function halls, 7-hole mini golf course, skateboarding park, tennis court, basketball court, volleyball court, badminton court, climbing walls and three swimming pools with water slides (including single loop, double loop and snake loop), a new dunk pool with water fountain, colored dancing lights and a play station. To help you plan a perfect meeting, Macagang Business Center Inc offers a variety of flexible conference rooms, catering services using the state-of-the-art equipments, and a fully equipped business center including internet access, fax, copy machine, and telephones. With three exquisitely appointed functional halls and outdoor facility, Macagang Business Center Inc. can host weddings or conventions with up to 1000 guests. Wedding ceremonies can be held outdoors, poolside or inside the function halls. Attendees will cherish your occasion because of our elegant ambience, impeccable service, and wonderful surroundings. For small business meetings and parties, our VIP rooms are available for reservation. Our functional halls are designed for conventions, trade shows, conferences, reunions, birthdays, cotillions, dances and graduations. Macagang’s staff will be very glad to help you design a function that fits all your needs. We offer catering services and can decorate your event. There are suites, economy rooms, and dorm type lodging units that are fully furnished and air conditioned. For wedding receptions catered by MBC Inc., we provide a complimentary overnight stay in one of our suites for the newlywed couple. Enjoy international cuisines at the Macagang Diner Main. Establised last 2007, the restaurant-café consists of menus-filled with local Nabua delicacies, regional menus and menus from around the world. We also offer ocean-fresh seafoods, hearty steaks, and delightful deserts (Macagang’s Halo-halo, Ampalaya and Mango Shakes, etc). Here, you will find every taste that suits your cravings. The café offers outdoor or indoor seating. For those who are interested in quick meals, we have pizza, pancit, lomi and sandwiches. The Macagang Diner will be your first choice when it comes to baked product. We accept orders for Macagang-made cakes for different occasions such as weddings, birthdays, reunions, etc. We also have a branch which is located at San Francisco, Nabua, Camarines Sur. Macagang Diner Centro offers a dining for those on the go and offers a complete and affordable menu from breakfast to dinner. On the first floor, Diner Centro has a fast access internet cafe with numerous stations. Macagang Purified Drinking Water has a mineral content that comes from a 430-foot deep well pump and processed using the latest Water Purification System Technology consisting of Water Softener, Chlorinator, Multimedia Filters, Activated Carbon Filters, and Ultraviolet Sterilizer. It is DOH approved. It also manufactures purified ice cubes. © Copyright 2012. Macagang Business Center Inc., Philippines. All Rights Reserved.